Layer up, sip some hot chocolate and enjoy! 1. Gaze at breathtaking, interactive Ice Castles located in Parks Canada Place at The Forks National Historic Site. This family friendly attraction is coming to Winnipeg for the first time this winter and needless to say, it will be very cool. 2. Work on you “snow-vasana” at the Fire & Ice festival by practicing yoga on a frozen lake, followed by crafts, s’mores, and wild bush tea at FortWhyte Alive (Feb 3). 3. Two Canadian passions collide with the invention of “Croki-curl” set up at The Forks, which blends the popular tabletop game of crokinole with curling. Rocks are available for use from The Forks Market free of charge; all you need are some friends to play with and good aim. 4. Pedal around wintry roads and trails with ease by renting a fat bike from White Pine Bicycle Co. at The Forks. 5. 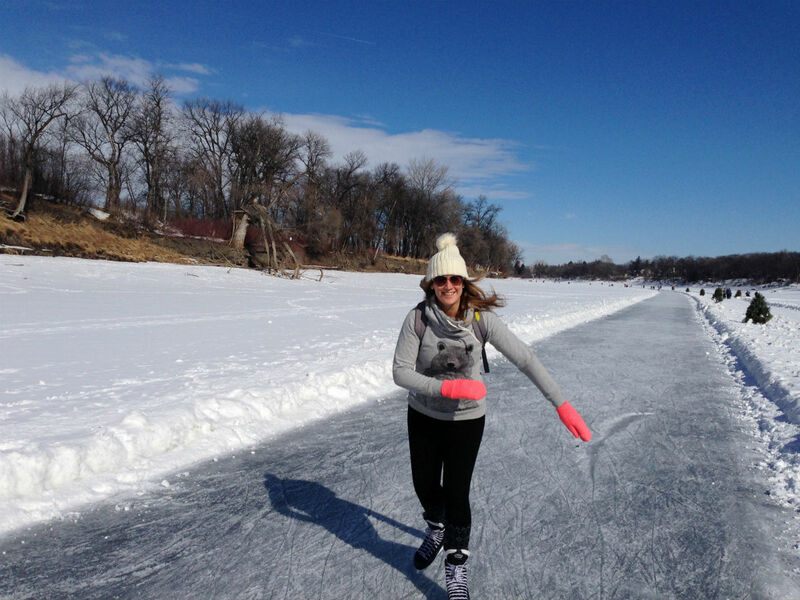 Skate along the Red River Mutual Trail, one of the world’s longest skating trails (rent skates inside The Forks Market). Test out your curling skills on one of the sheets set up on the river or play a game a hockey. Entry onto the trail is located at The Forks Historic Port. 6. Bring a fully charged cell phone so you can stop for photo ops at the Warming Huts dotting the Red River Mutual trail. This year's new winning designs include huts from Morelia, Mexico, Vancouver, British Columbia and Tallinn, Estonia, along with an invited guest hut titled "Temple of Lost Things" by acclaimed Winnipeg filmmaker Guy Maddin. 7. Located at The Forks, Arctic Glacier Winter Park features 1.2 km of groomed skating trails, toboggan run, snowboard park, plaza skating rink, Olympic-sized skating rink and more. 8. Head downtown to Bell MTS Place and catch an exhilarating Winnipeg Jets National Hockey League game or see their farm team, the Manitoba Moose of the American Hockey League. 9. Warm up from the cold with a steamy hamam treatment at the luxurious Ten Spa, or unwind in saunas and hot pools at Thermëa by Nordik Spa-Nature. 10. “Surf” on snow during a kiteboarding session at Oak Hammock Marsh. 11. Dine on a frozen river at RAW: almond pop-up restaurant, which runs from January 19 to February 14 on the frozen Assiniboine River. Everyone sits at a communal table and savours a gourmet multi-course meal prepared by talented local and invited guest chefs. Pre-sale tickets available December 10 at The Forks Market starting at 9 a.m. (doors open at 7 a.m.), with online sales beginning on December 11 at 8 a.m.
12. Festival du Voyageur, Western Canada’s largest outdoor winter celebration, channels the spirit of Manitoba’s fur trading past, celebrating the culture, art, food, music and dance of Métis and Franco-Manitoban adventurers. 13. Admire Arctic species including Arctic fox, snowy owls, caribou, seals, wolves and polar bears as they play in the snow in Journey to Churchill at Assiniboine Park Zoo. Prepare to be dazzled if you happen to catch the polar bears performing underwater bear ballet in the viewing tunnel found in the Sea Ice Passage. 14. Rent cross-country skis and glide along groomed trails at Windsor Park Nordic Centre. 15. Snowshoe by moonlight on a tranquil guided hike at FortWhyte Alive. Warm up afterward with tobogganing, hot cocoa and a roaring bonfire. 16. Scale new heights at the Club d’escalade de Saint-Boniface’s 20-metre ice tower. All levels are welcome and ice climbing equipment is available free of charge. 17. Ride in a two-horse open sleigh and see these massive horses in action at Assiniboine Park Zoo’s McFeetors Heavy Horse Centre. 18. Pedal a fat bike for a “ Bikes and Brunch” tour around downtown’s best brunch spots. 19. Gear up for winter with toasty and chic winter wear manufactured in Winnipeg, including Canada Goose parkas and Manitobah Mukluks. 20. When the temperatures drop, Winnipeg’s arts and culture scene heats up with events, festivals, performances, exhibits and concerts taking place every day. Find out the latest happenings in Tourism Winnipeg’s Event Calendar.